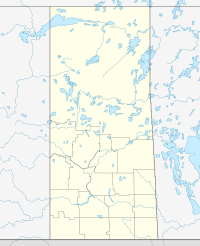 The town of Bienfait was incorporated as the Village of Bienfait on April 16, 1912 becoming a town on March 1, 1957. The town was named by the Canadian Pacific Railway after Antoine Charles Bienfait, a banker with Adolphe Boissevain & Company of Amsterdam, due to the firm's involvement in the sale of CP shares in Europe. In 1931 striking coal miners marched from Bienfait to nearby Estevan, resulting in the Estevan Riot. ^ Government of Saskatchewan, MRD Home. "Municipal Directory System". Archived from the original on January 15, 2016. Retrieved 2014-03-11. ^ "2011 Community Profiles". 2011 Canadian Census. Statistics Canada. July 5, 2013. Retrieved 2012-12-24. ^ "2006 Community Profiles". 2006 Canadian Census. Statistics Canada. March 30, 2011. Retrieved 2012-12-24. Endicott, Stephen (2002). Bienfait: The Saskatchewan Miners' Struggle of '31. Toronto: University of Toronto Press. ISBN 0-8020-8452-4.